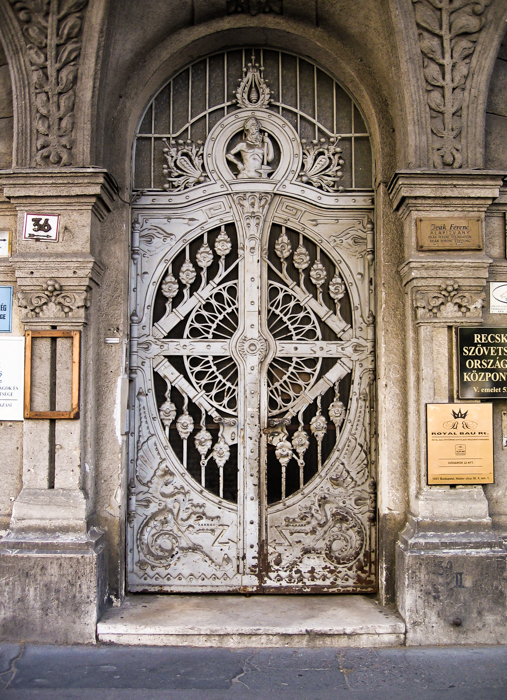 I noticed that a friend had been posting images of doors in Budapest on social media, and that made me think about some I had done myself on a visit there a little while ago. So I rummaged through my files and picked this one, which I think is the best of the batch I shot on that occasion. I wonder what it is about doors. They always make a good subject for photography. I guess in part it is the fact that the shape follows the frame of the photograph – loosely, and if you’re shooting in a rectangular format, not a square or nearly-square one, of the sort you get in medium-format cameras – so a satisfying composition is more or less guaranteed. But I think it is also to do with the sense of mystery and expectation, and sometimes history, that a door possesses. There’s the wear and tear of wars and weather and thousands of openings and closings, and the enigma of what goes on behind it, onto which we can project our own fantasies. And, of course, it is a site within a much larger piece of architecture that can be singled out for special decorative treatment and expression of the (now presumably long-gone) owner’s personality. I cannot read Hungarian, so have no idea what those signs around the door might tell us about what goes on behind it – other than the fact that it is clearly multiple-occupancy, with several different concerns having offices there – so the enigma remains.